Buttery, melt in your mouth shortbread cookies are studded with sweetened dried cranberries and orange zest for a burst of fruity flavor. The dough is made ahead of time, so whenever the cookie craving hits, you can just slice and bake! It's not even Thanksgiving and I've already put up a Christmas tree. NO SHAME, GUYS. Tis the season, and all that, and when my friend Keegan obtained an 8' artificial tree in a box, I couldn't get to his apartment fast enough. There were carols to be sang! And ornaments to be hung! And boozy eggnog to be chugged! ...and, most importantly, cookies to be baked. 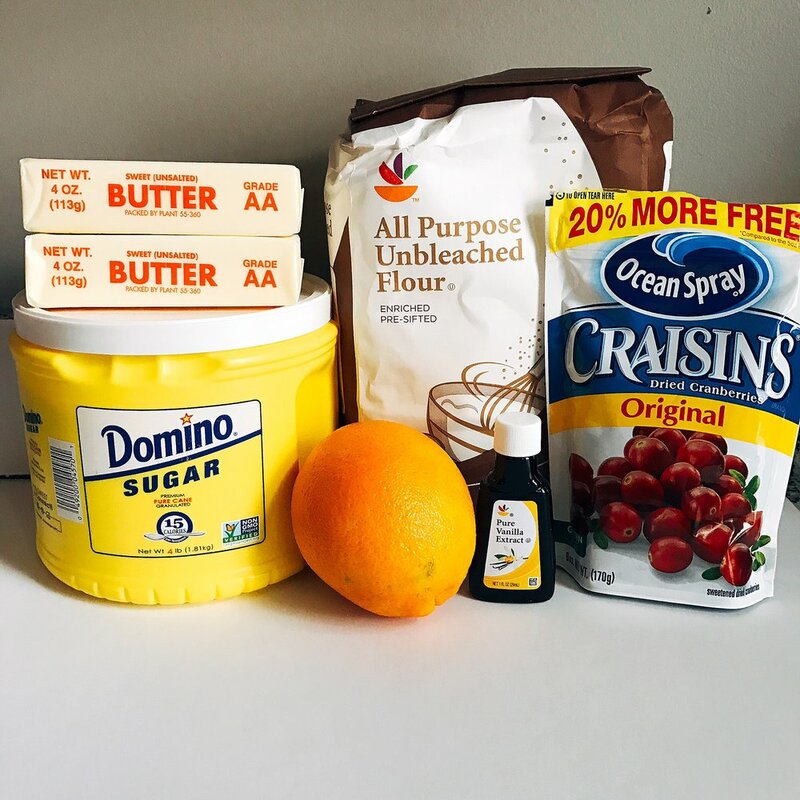 More specifically these cranberry orange shortbread cookies, because a) it's a very wintry flavor and b) I had leftover craisins from a recipe coming later this week, and if I just keep them in my cabinet I will shovel them by the fistful into my mouth. It's obviously much better to shovel cookies into my mouth. Duh. First, combine your dried cranberries and 1/4 cup granulated sugar in a food processor. Process for just about a minute, until the cranberries are broken up and the sugar is combined. Set aside. 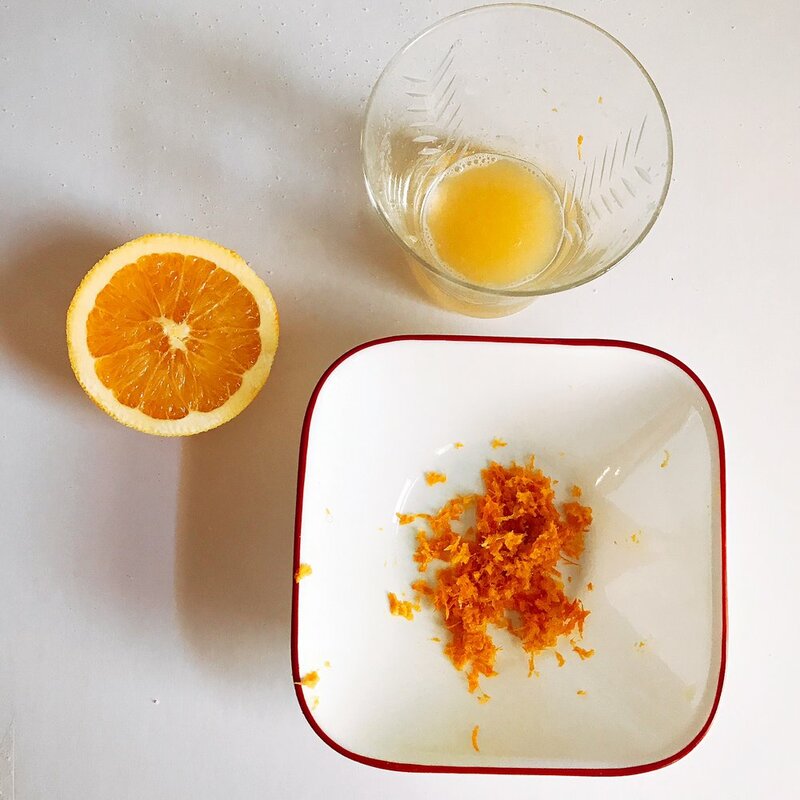 Next, use a microplane to zest your orange, then squeeze the juice of half the orange into a glass. Set aside. Unwrap your cold butter, slice it into cubes, and set aside. Now, it's time to put it all together! In a large bowl, combine the flour and remaining 1/2 cup sugar. Using a pastry cutter, cut in the cold butter until the largest pieces are pea-sized. Next, add the orange zest, orange juice, sugared cranberries, and vanilla, and use your (clean!) hands to mix it all together until it forms a shaggy dough. If the dough is too dry, add a little bit more orange juice. Then, turn your dough out onto a sheet of aluminum foil. Shape the dough into a log, wrap it in the foil, and set in the fridge for at least 3 hours, unless you want your cookies to spread all over your pan. Which could be fun. But like, probably not what you were going for, ya know? Once your dough has sufficiently chilled, preheat the oven to 350F and remove your dough from the foil. Slice off as many cookies as you want, then space them out on a baking sheet lined with parchment paper or Silpat. Bake for 12-15 minutes, until edges are golden brown, and serve! The best part? You can keep the log in the freezer for months at a time (not that they'll last that long...), so whenever you need a cookie, you can slice one off and bake it up! Just add a couple minutes to the bake time if the dough is coming straight out of the freezer.